It's been a long week. I think I'll take it easy in the middle of my toys near my kitty blanket. Have an Easy Sunday! Today's Photo Hunt theme is "spotted." Since I don't have spotted floof, I had to go to mom's PJs. She got these black and white spotted PJs for Christmas. They are very soft and warm. I like to use Mom's spotted PJs for climb up mom's leg to get to my treats! What's a floofy ladycat to choose to play with first? I think my peacock feather looks quite fetching! I received a very special, early Valentine's package from one of my BF, Romeo! Isn't he a handsome mancat? When mom got home, this package was waiting for me. I checked it out very closely before Mom opened it. 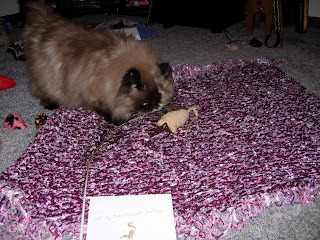 Just look what was in the box - a specially made Kitty Blankie from Peggy! It's burgundy (which is the color of our favorite football team) and pink (one of my favorite colors) and it's so soft. There was also a mouse and a peacock fev-ver! I really enjoyed the fev-ver! Notice how my eyes are the same color as the fev-ver! MOL. Mom tried to get rid of the red and it wouldn't go away. 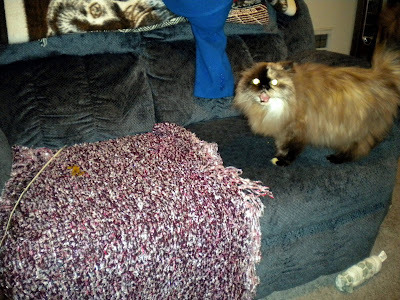 Mom put my Kitty Blankie on my couch where I could relax and watch TV! Notice how I am telling Mom where to put it! 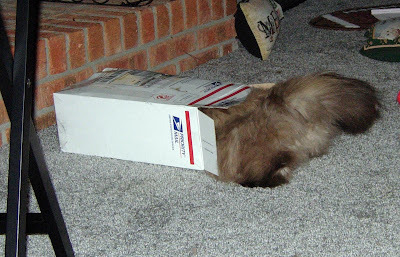 Of course, every kitty must investigate the box once it is empty. Mom says I'm too big for the box! What do you think? 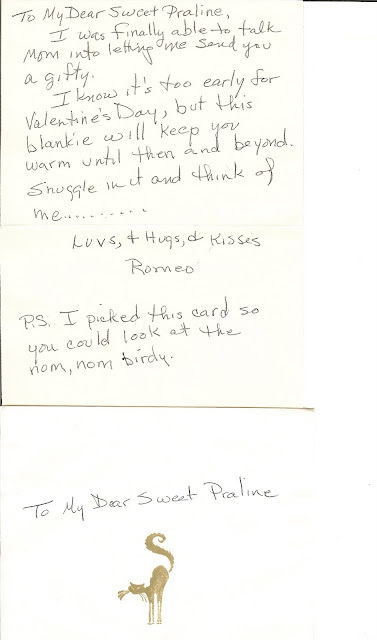 That was so nice of Mom Peggy and Romeo. Thank you so much! I'll share more pictures later. I am so thankful to have such nice furriends and their moms! I don't care if it is Toesie Tuesday, I'm not putting on those shoes! 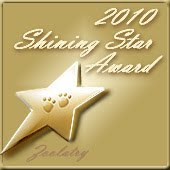 I received the Shining Star Award 2010 from my Zoolatry furriends, Maggy and Zoey and the ZH, Ann. I think they deserve platinum stars for all that they do to make our day brighter. Thanks, girls. I also received a surprise package from one of my BF mancats this weekend. I'll post about it very soon! It's really special! Many of you wondered where the treats were on Saturday's post! I can assure you that I was continuing my balanced diet with treats! I tend to get a little wild eyed when my Mom holds out one of my treats for me. Shhhhhhh! Don't tell mom I shared a picture of me taking a nap in front of her junk closet! This is my idea of balanced! Crunchies, fresh water, and stinky goodness! Mom says to ignore the mess on the floor. She says I'm a messy eater! I tell her I just enjoy my food. I've had a little bit of a problem with all of my floof this week. 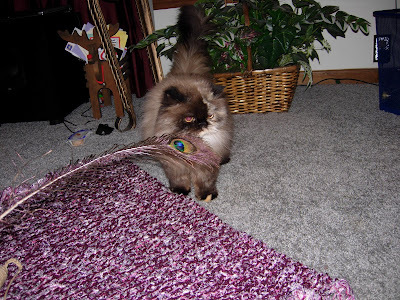 You've already heard about my hairball and now mom has found a lot of mats. She hasn't been able to comb me as much as usual with her shoulder surgery and the result has been those pesky mats, especially on my belly under my legs. She's worked on them a little each night and we are slowly getting rid of them. The good thing is that you can't see the mats! MOL! Hey Mom! Can I help you clean up? I know your shoulder is hurty, but I just couldn't help that hairball yesterday! Just a short note about my mom - her shoulder is slowly gettng better. She's still in a sling and must take a prescription anti-inflammatory pill during the day and a pain pill at night to sleep. She is still going to PT twice a week. Thank you for all of your thoughts and purrayers. Thought I would share my seal pointed toesies, tail, and ears today. My body is considered a torti, but I have pointed extremities! 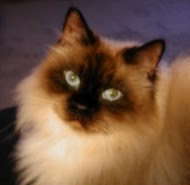 Sometimes, I think I look a little like my red Persian daddy! And for Wendy, here's my face! I have a unique way to get my face washed, especially around my smooshie nose. I let my mom do it. I will lick my mom's finger and then rub my nose and eyes on her finger. I've done this since I was a kitten. If you listen closely, you'll hear my purr. My mom says to ignore her southern baby talk! Taking it easy today. How about you? I think I'll spend my Saturday in my little corner of the office today. Now, how's this for some floof on Friday? Have a great weekend. 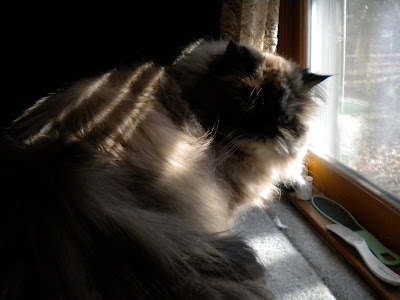 I'm thankful that it is slowly warming up during the daytime (even though it's still in the 40s) and for the sunshine on my floof! This is one of my favorite spots to sit and look out the window. Would you believe this is my specially made litter box? The floofy kitties are in danger on the CB! If you will check out the story on Rumblebum, it appears that Misha has lost it and has kittynapped the floofy kitties and it stealing their floof. Currently, my BF, Ginger Jasper and I are captured with our beautifuil floof to be taken next. Imagine my surprise when I discovered this brush full of floof in my mom's hands. What could she be doing with it? Is she in cahoots with Misha to collect my floof and sell it on the black market for green papers? That's mine, Mom! Put it back! Only time will tell if Baby Patches and Doctor Mew can save Ginger Jasper and Sweet Praline from the evil fate! Maybe he watched Cats 101 and saw the lady who makes handbags from floof that has been shaved and he wants to start making floof coats for our less than floofless friends that are cold. Maybe if I hide my face in the floof, Misha won't recognize me and my floof will be safe! Stay tuned! I don't see how all of my furriends in the northern parts of the U.S., Canada and Europe stand the cold weather and the white stuff all of the time. It has been so cold here in S.C. the past two weeks. Mom bought some "fake" wood to burn because she is running out of the real stuff. She says it is so dry because she hasn't needed it during the past two years and now it burns like crazy. If this cold weather continues, we'll be out of the "fake" stuff soon! I hope all of you are able to stay warm this week. And for my southern hemisphere furriends, stay cool! Have an easy Sunday, my furriends! This is another spot that gets warmth from the bathroom vent in the hallway that I like to lie down and snooze. Today's theme is "bulky". With all of this cold weather in SC lately, I need to find something bulky to wear over all of my floof to keep warm. I wonder if there is something in this closet. This morning (EARLY) ended the college football season for a few months. Those who follow my blog know that my mom is a South Carolina Gamecock and that we love to watch college football. The national championship game was between elephants (Alabama) and cows (Texas) and both of them are a lot bigger than chickens (South Carolina). We didn't really have a "dog" in this fight, but since Alabama is part of the SEC, we were pulling for them. We were sad to see the quarterback from Texas hurting his shoulder and hope he will be okay. Okay, Mom! Halftime and it's time for my evening snack! It's entirely too cold in South Carolina. I've left the comfort of mom's lap for the warmth of the heat vent in the bathroom. Isn't it nice how mom has placed a rug right in front of the heat vent for me? Would you believe they are actually calling for snow in SC tonight? Wake me up when it's Spring! Time to expose the tummy for all of my adoring fans! MOL! I figured you could ignore the laser eyes if you saw the tummy. Unfortunately, my month with mom at home has come to an end. She is scheduled to go back to work today after her physical therapy this morning. I'm still turning on the purr therapy because she hasn't been able to use her shoulder much at all since last Sunday when she hurt it again. Be careful today, Mom! I'll be here when you get home. I'm trying to get whatever sunshine I can. There was just a little bit yesterday, but it sure was cold outside. I think I'll go back to mom's lap and snuggle in for the day. Even though she has been told to have very limited use of her right shoulder, she is supposed to go back to work tomorrow. I drive my mom crazy because I like to "lick" plastic. I will wake her up in the middle of the night licking a plastic bag if she hasn't thrown it into a bin with a lid on it. 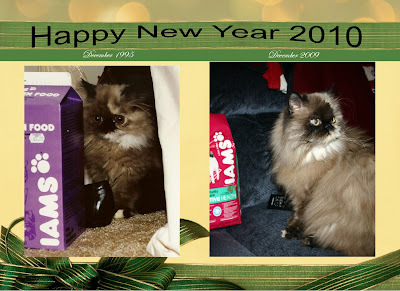 I want to wish everyone a very Happy New Year. In honor of Fin's 13th birthday (It's also his mom's birthday) I'm participating in "Show Your New Year's Baby" game. Many of you have seen these pictures before, but the PT has put my mom on very limited use of her right shoulder, so we are recycling. 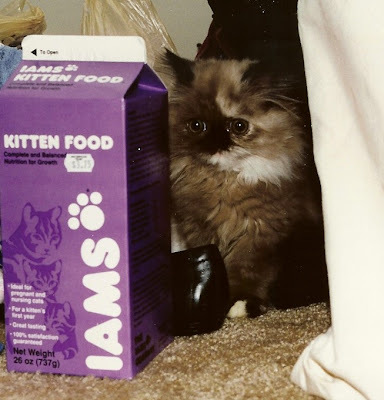 We really like these pictures because it shows that I am still eating the same kind of food 14 years later and am the more beautiful for it.